About six weeks ago, Susan and I canoed in Maine, then made a brief excursion into Québec. 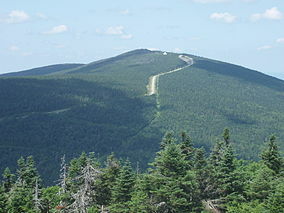 We planned to visit the area around Mont Mégantic, a monadnock about 15 km north of the border. It’s in the middle of the Parc national du Mont-Mégantic and is the terminus of the Sentiers Frontaliers, a hiking trail that connects with the Cohos Trail in the US, which runs north from Crawford Notch, NH to the border. The trail is in a beautiful area, and represents an even more beautiful cooperation among volunteers on both sides of the border, who are working to make ways to enjoy, but tread softly, in the forests and rivers. 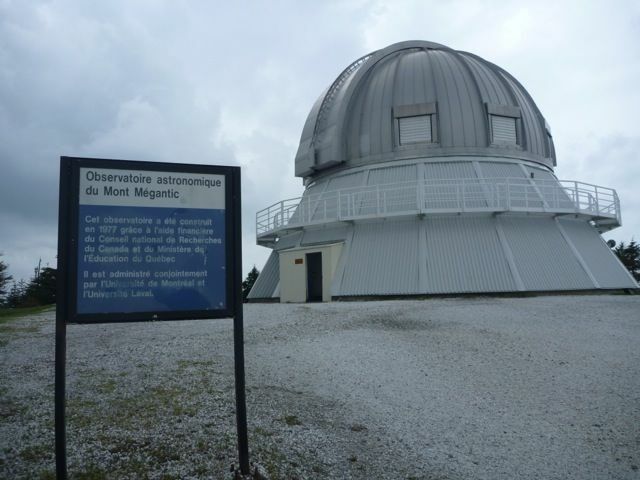 The treasuring of the environment is even more evident there because the Mont Mégantic Observatory is the first site to be recognized as an International Dark-Sky Reserve. Lighting within a 50 km radius is strictly controlled to minimize the impact of artificial lighting on astral observations and on wildlife. Again, international cooperation will be needed to sustain the dark sky, but already a rare resource has been created in which both professionals and amateurs can enjoy seeing the Milky Way and know that at least in this one small region respect and love for nature prevails. We came to the Mégantic area from the east, and actually slightly north, having visited Saint-Georges. 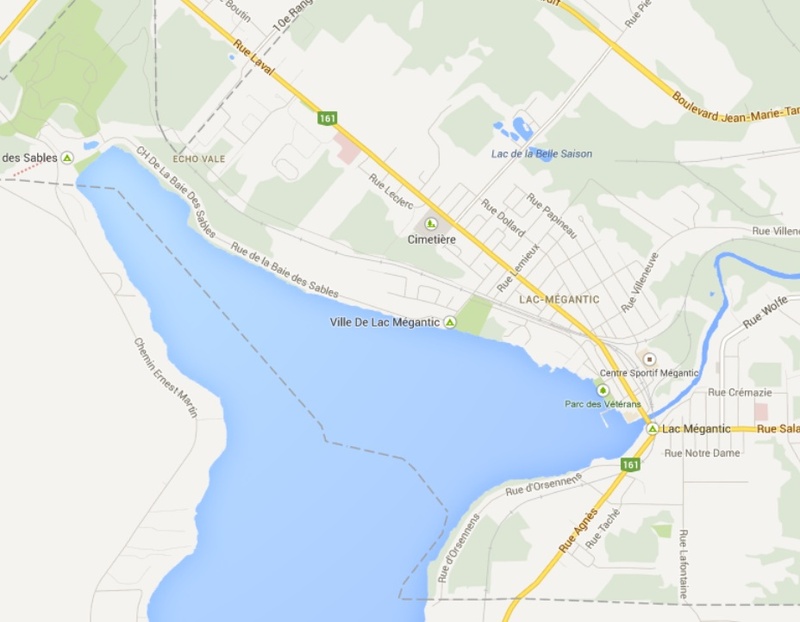 Traveling on back roads we reached the village of Nantes, at a small elevation and a few miles from Lac Mégantic. From there we descended into to the beautiful lakeside town of Lac-Mégantic, following the little used rail line along Rue Laval. We walked for a while around the town and in the parc des Vétérans. If we had not had a B&B reservation, we might have stayed longer to enjoy the lake and the small town atmosphere, which fit so well with what we knew about the peace with nature in that region. But unlike so many who have suffered there, we were fortunate to be away when disaster struck. On July 5, a Montreal, Maine and Atlantic Railway train engine near Nantes caught fire. That fire was extinguished and the train was left unattended, parked on the line. 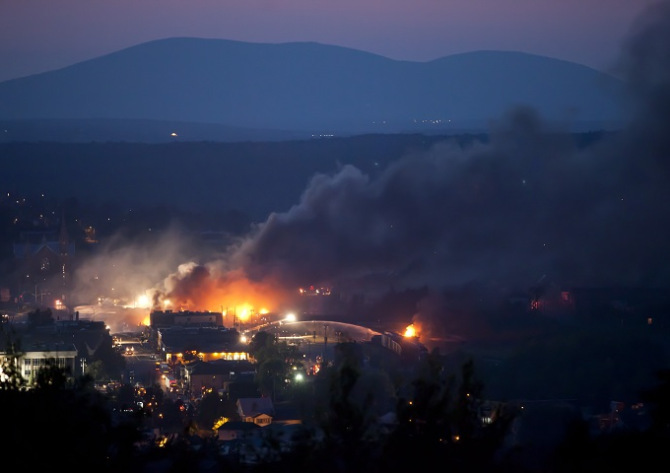 Hours later it rolled down the grade towards Lac-Mégantic, derailed, exploded, and turned the town into an inferno. There were soon photos of the physical destruction, but accounting for deaths has been slow due to the extreme destruction. Aujourd’hui, nous sommes tous des citoyens de Lac-Mégantic. The story has moved to the back pages of US media, even as the death toll has risen to 38, with many still unaccounted for. As awful as some more publicized recent bombings, explosions, fires, plane crashes, etc. in North America have been, this disaster is already more deadly than all of those combined. Of course, the tragedy might not have affected me so much if I hadn’t felt some kinship with the area. But it has made me both sad and angry. It’s impossible to imagine how people can cope with the loss of loved ones and the destruction of their town. I’m glad that people are asking questions, starting with some basic ones such as: Why was a train with 70 full tanker cars left unattended? and Why weren’t the brakes set? It’s good that some are moving on to bigger questions: Why do Canada and the US still carry 70% of oil using a tanker car design that was deemed unsafe over 20 years ago? Why is it allowed to send dangerous cargo on regional (Class II) rail networks, which have fewer safety mechanisms and less thorough safety checks? For some people, the answer to all of these questions is to build more pipelines, which destroy the environment more when they rupture, but may kill fewer people directly. The rail disaster will also give support to defenders of nuclear power, e.g., the aging Pilgrim, Mass. plant that uses the same design as the Fukishima reactor and strangles any possible escape route from Cape Cod. Others might call for renewable energy, which still needs to be transported at great environmental cost. I wish that there were a moment when we might ask: Why must we design our society around cheap energy? Must every politician in every party declare that cheap gasoline is their first priority? Would it be so awful to minimize the loss of life and environment, and possibly even lessen the imperative for war? Is “cost” only what we see on a bill for goods and services? Could we reduce energy use so that areas such as Mégantic could remain unspoiled, or at least less spoiled? And that no Lac-Mégantic would ever experience such a disaster again? Has your sleep returned to normal after BP’s Deepwater Horizon disaster? If so, it may be time to think about why this was not an aberration, why we’re likely to see more and even larger disasters in the near future. Michael Klare lays out some plausible scenarios in a recent Mother Jones article, BP-Style Extreme Energy Nightmares to Come. The only thing that seems implausible is that we can continue to extract energy at the rate we do now without ever greater environmental, political, and economic costs.